TS Proc.No. 1442/ CMO/T4/SS/2019 dt:22.03.2019.Sub:-TSSA Hyd-CMO- Conduct of Prof. Jaya Shankar BadiBata Programme for the year 2019-20 - Preparatory Programme- certain instructions-Reg. TS Badi Bata program Instructions 2019 | Prof. Jaya Shankar Badibata Activities and Day wise Schedule RC 1142 Download. TS Schools Prof. Jaya Shankar Badibata Programme Activities, Guidelines 2019-2020. BadiBata Programme Instructions released by Telangana SSA. TS Schools Badi Bata Programme Enrollment Drive Objectives, Guidelines 2019 TS Schools Badi Bata Schedule-Day wise Programmes, Activities and Guidelines 2019. TS Schools Badi Bata Programme Special Enrollment Drive Day wise Programme 2019 -2020. Prof Jaya Shankar Badi Bata program will be conducted in all the government schools in Telangana. Badi Bata Program, Admission in to schools in Badi Bata program, Out of School Children identified in Badi Bata Program, Prof Jaya Shankar Badi Bata Program. State Project Director, Samagra Shiksha Abhiyan, Telangana, Hyderabad has issued orders to conduct the Prof Jaya Shankar Badi Bata program 2018-19 from the beginning of the academic year 2018-19. Instructions have been issued on the preparatory programs in all the schools of Telangana state. All the District Educational Officers & Ex-DPO, SS in the State are informed that it is proposed to conduct of Prof Jaya Shankar BadiBata Programme for the Academic year 2019-20 in the month of June 2019 in State. In this regard the following preparatory programmes shall be organized before closer of schools for summer vacation. Every HM shall prepare school profile highlights of school performances and plans to improve with a request to parents to join their children in Government School. Update the Village Education Register (VER) with name wise and no.of children in the age group 5 to 15 with enrolled and out of school children and same information should be updated in Child Info website. Dropout, Child Labour, etc. in the school catchment area. Preparing the test of enrolled children in the catchment area i.e., separately for Govt./Local body Schools, Private recognized schools, Residential Schools, Model Schools and KGBVs etc. Prepare and keep ready of School Development Plan. Completion of Registers and Records, Cumulative Records and finalization of results for the year 2018-19. Preparing Anrual Plans and Lesson Plans for the Academic Year 2019-20 by all teaches including Head Master. The MEOs shall prepare the list of all Otit of' School Girl Children, drop out gills, girls who are in danger of dropping out etc., based on the reports from the school HM shall be forward the same to the Principal KGBV in the Mandal for admission. The KGBV Special Officer arid other KGBV staff shall set up an information and admission desk ate the KGBV in order to give on-the-spot counseling and admission to OSC girl children. Preparation of Plan for Door to Door campaign by the HM and Teaches for the enrollment of children as per the list. The SMC and the Mandal Educational Officers concerned must ensure for 100% transition of Class V children into Class VI and Class VII children into Class VIII into the nearby High Schools. Head Masters are responsible for 100% transition. Every Head Master of PS/UPS/HS shall prepare school profile. ie Total NO. of school age children in the catchment area number enrolled, number of out of school children, Performance of the children, status of receiving free uniforms, free text books, Midday meals for the academic year 2019-20. The HMs shall prepare the list of outgoing children, ie class 5th and hand over to the nearby High school/Upper primary schools for their 100% enrolment. Similarly the HMs of UP schools shall prepare the list of class 7th/8th children and handover the list to the HM of nearby HS. Door to door campaign by the HMs for enrollment of all children in the catchment area. 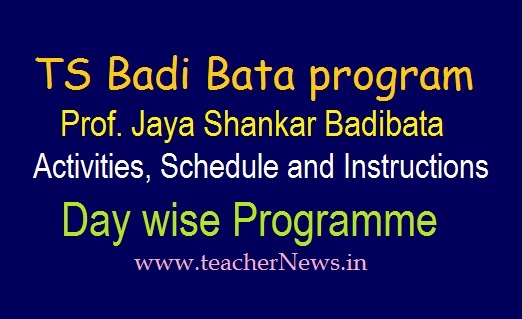 TS Badi Bata program Instructions 2019, Prof Jaya Shankar Badibata Activities, day wise Schedule Download. Telangana Schools Enrollment Drive Objectives, Guidelines 2019.